Working as a full-time food blogger can be demanding on your time. In fact, because a food blog also represents your passion, it can easily consume more and more of your time. 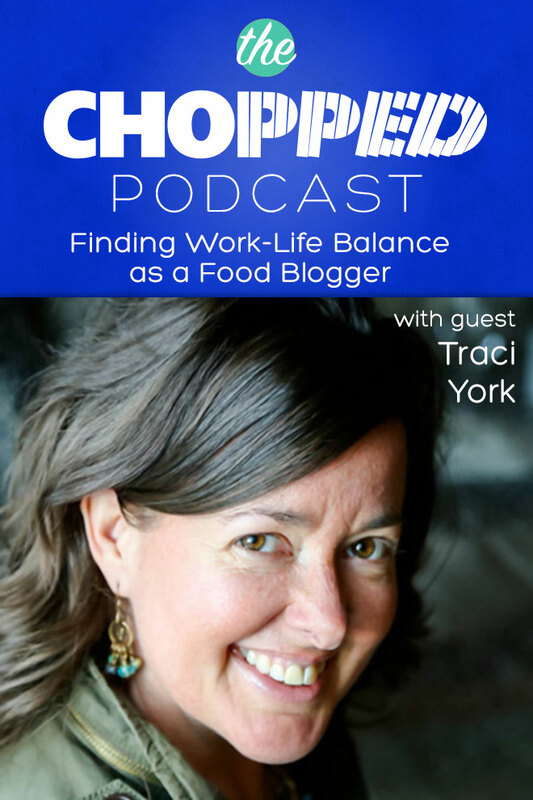 Traci York is here with me today talking about ways of Finding Work-Life Balance as a Food Blogger. If you’ve ever struggled with this issue as well, listen on for some of Traci’s great tips! Traci started her blog as a passion and within a relatively short amount of time was experiencing great growth on her blog. Sometimes success so early on can be a great thing, but it can also have some negative parts to it as well, such as trying to find work-life balance. Traci was previously a teacher. Have you noticed this trend? How a lot of successful food bloggers have been teachers before? It seems like that’s an important process to blogging that we oftentimes overlook— the art and science of teaching our audience. Traci said she was in the process of becoming vegetarian when she began searching for resources on how best to do that. She feels like her blog is now a way of giving back, by helping others who may be considering the same lifestyle. Sometimes we allow our schedules to get a little harried because we’re desperately trying to take things to the next level. It’s a little bit like applying the “more is more” philosophy to blogging. And in some cases, when done correctly, that can work. But if you’re feeling like you’re hitting your head against the wall or exhausted, maybe it’s a sign you’re taking on too much. Maybe what’s required in a situation like that is a little faith. I love this quote from Marie Forleo in her episode called Falling Behind in Life. A lot of Falling Behind Syndrome stems from spending too much time comparing ourselves to others. What Traci recommends is really knowing yourself and understanding how you can do your best work. That can bring the passion back to your work! We talk about the concepts of fear and how that can hold us back from doing our best work. Traci has a way of starting her day that helps her stay grounded. If you listen, you can tell that Traci really knows herself. This helps her understand what’s important to her, how long different parts of each blog post will take to accomplish, and the steps to make them happen. Just in case she sounds a little too planned out, Traci also points out that she’s had some kitchen fails, along with surprises that come along in her CSA packages, that cause her to improvise her day. Most importantly, Traci recommends having a life, and spending time in that life, to make your work the best that it can be. Traci also shares some of her favorite blogging tips as well. Learn more about finding work-life balance as a food blogger today! We talk about Pinterest sharing strategies, including our favorite scheduling app! Give a shout-out to Traci and connect with her via Twitter and Instagram! Next week’s podcast episode will feature an episode recorded live at the Chopped Conference! We’re talking about nutrition tips with Sarah Downs of Best Food Facts. Subscribe today so you won’t miss it! Thank you so much Carrie! I appreciate your comment. It’s great to hear from someone who has seen the transformation in Traci’s life. It’s probably why she’s such a perfect person to interview on this topic. And thanks for your wonderful feedback. You really made my day! Thanks Traci! It was so much fun talking with you. 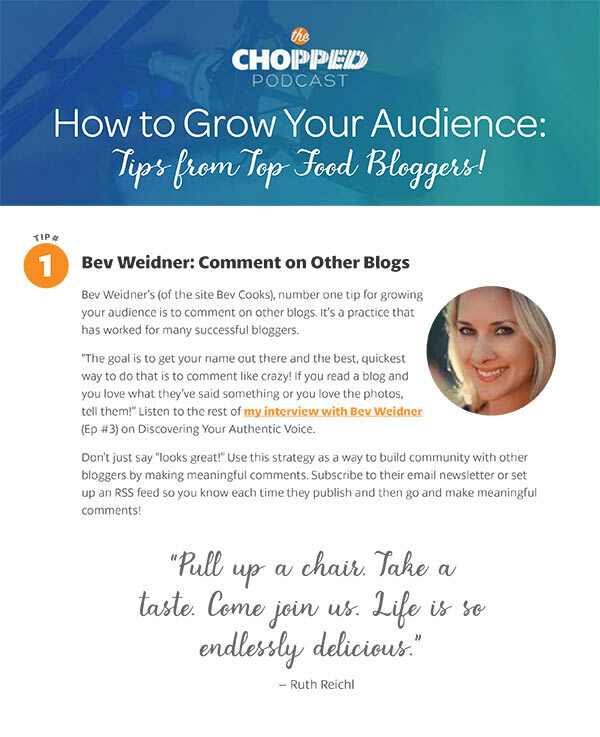 I loved sharing your thoughts on blogging with the Chopped audience! Yes, Gary is such an inspiration! Glad you liked this episode. And thanks for the link to your summary of the Australian food blogging conference. It’s such a thorough write-up and looks like it was an amazing event!